Norway exported 40,000 tonnes of shellfish valued at NOK 1.7 billion in 2017. This is a decrease in volume of 2 per cent and a reduction in value of 7 per cent from 2016. Norway exported 9,221 tonnes of prawns worth NOK 698 million in 2017. This is a reduction in value of 5 per cent and a decline in volume of 4 per cent from 2016. Norway exported king crab worth NOK 509 million in 2017. This is a reduction of 4 per cent from 2016. NOK 225 million worth of snow crab were exported in 2017, a reduction of 34 per cent from 2016. Sweden was the largest export market for shellfish from Norway in 2017, followed by South Korea and Denmark. - The reduced export value for shellfish in 2017 is because of reduced catches of king crab, snow crab and prawns. Increased prices have not been able to compensate for this, but 2015 and 2016 were extremely good years and in 2017 we were far above previous years, says Ingrid Kristine Pettersen, Seafood Analyst at the Norwegian Seafood Council. Sweden was the largest export market for prawns from Norway, with a value of NOK 326 million, which is a reduction of 16 per cent from 2016. There are still no other countries in the world that eat more frozen, peeled cold water prawns per person than Sweden. The exports to the United Kingdom increased in the same year by 10 per cent to NOK 103 million. The United Kingdom thus became the second largest market for prawns from Norway in 2017. Finland was the third largest market, and the exports declined by 14 per cent to NOK 95 million. - Reduced quotas near Canada in 2018, and somewhat increased quotas around Greenland, may add up to somewhat better market conditions and a certain upturn in the price picture. This provides hope for increased catch effort in Norway and thus strengthening in the exports from Norway in 2018, says Pettersen. Norway exported live king crab worth NOK 254 million in 2017. This is a reduction of 3 per cent from 2016. The principal market for live king crab in 2017 was South Korea, which was responsible for 52 per cent of the exports. The export value declined by 19 per cent compared with 2016, to NOK 131 million. The U.S. and Canada were the second and third largest markets, with increases in export value of 18 and 9 per cent, respectively, compared with 2016. For frozen king crab, the exports have been reduced by 5 per cent to NOK 255 million in 2017. The export value for live king crab to South Korea declined by 19 per cent. The total export value for king crab to South Korea thus increased by 2 per cent compared with 2016. A considerable part of the crabs in South Korea are re-exported to South-east Asia and the U.S.. Japan was the largest market for frozen king crab in 2016, but it ends up in sixth place this year with a reduced export value of 86 per cent. - The reason for this is that Japan has not managed to compete with well paying markets in Europe and the U.S., says Pettersen. 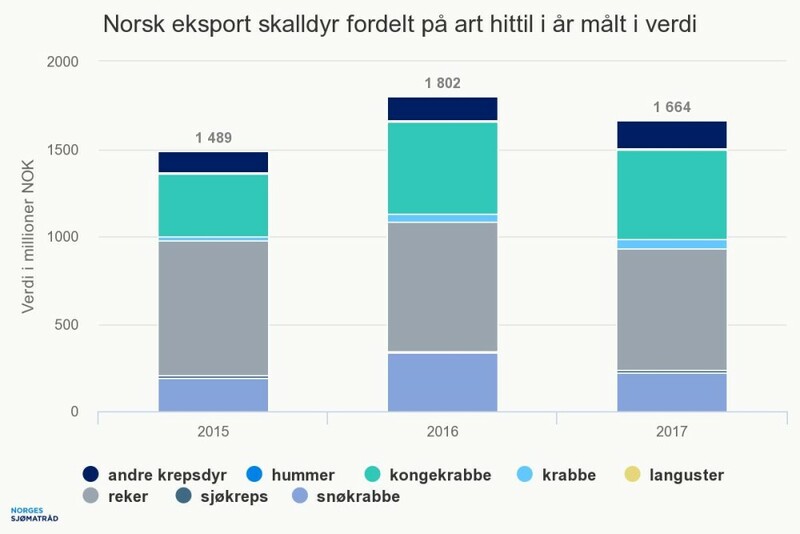 Norway exported 1,901 tonnes of frozen snow crab worth NOK 224 million in 2017. This is a volume reduction of 52 per cent from 2017. The average price in 2017 was NOK 117.97 per kg, an increase from NOK 83.73 per kg in 2016. The largest markets were Japan and Denmark. - The reason is a reduction in catches landed in Norway because Norwegian and EU vessels were banned from the Russian continental shelf in 2016. The reduced supply also explains the higher prices, says Pettersen.